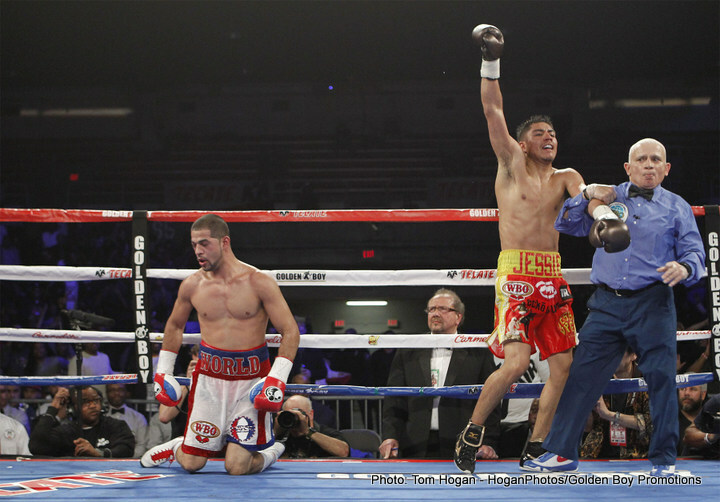 (Photo Credit: Tom Hogan-HoganPhotos/Golden Boy Promotions) Jessie Vargas (27-1, 10 KOs) and Sadam “World Kid” Ali (22-1, 13 KOs) squared off in the co-main event for the WBO Welterweight world championship. Both fighters landed big power shots throughout the first half of the fight, but at the end of the eighth round, Vargas caught Ali with an overhand right that dropped the previously undefeated fighter. Ali made it out of the round but was still on shaky legs in the ninth, and Vargas continued to apply pressure until the referee jumped in and stopped the fight toward the end of the round. WBA Interim Heavyweight World Champion Luis “King Kong” Ortiz (25-0, 22 KOs) continued his rapid descent up the heavyweight division, knocking Tony “The Tiger” Thompson (40-7, 27 KOs) down twice before finishing him with a huge knockout in the sixth round. Luis Ortiz vs. Tony Thompson was a 12-round heavyweight fight presented by Golden Boy Promotions in association with King Kong Boxing and Warriors Boxing. Sadam Ali vs. Jessie Vargas was a 12-round fight for the vacant WBO Welterweight World Championship presented by Golden Boy Promotions in association with Top Rank, the HBO Boxing After Dark ® telecast began live at 10:00 p.m. ET/PT. Robinson Castellanos vs. Oscar Escandon was a 12-round fight for the WBC Interim Featherweight Championship and the Ring TV live stream begans at 9:00 pm. ET. The event was sponsored by Cerveza Tecate, BORN BOLD and Carmelita Chorizo.